The product is mainly used as a guiding mechanism for feeding linear material onto a rotating reel during the winding process, where one rotation of the reel requires a traverse movement equal to one diameter of the material being wound. 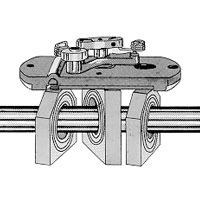 The shaft carrying the traverse unit must rotate with a constant relationship to the rotation of the reel being wound. This is effected by a toothed belt connection from the shaft supporting the reel to the traverse shaft. (See illustration top left). The unit is self reversing, so the direction of the shaft rotation does not need to be reversed to effect travel in the opposite direction. The place where reversal occurs is dictated by the position of stops adjacent to the shaft which reverse the angle of the bearing set on contact. For ease of operation all models are fitted with a disengaging lever which releases the unit’s grip on the shaft allowing the user to slide the traverse along the shaft to any desired position.